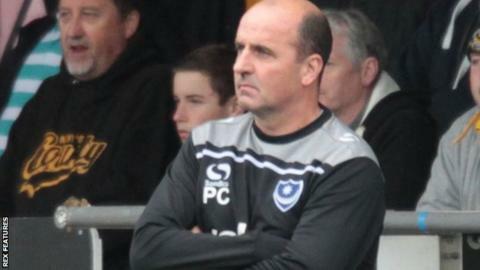 Portsmouth manager Paul Cook is set to be without long-term injured pair Gary Roberts and Matt Tubbs for a month. Winger Roberts has already been out for three weeks with an ankle problem, while striker Tubbs missed the FA Cup first round win against Macclesfield. But Cook believes the addition of loan signings Caolan Lavery and Marc McNulty have maintained their threat in attack. "Over the course of a season everyone will have problems with injuries and suspensions," he told BBC Radio Solent. Portsmouth, currently third in League Two, face AFC Wimbledon at Fratton Park on Sunday. "We're not quite sure on the extent of Gary's injury after he had a scan this week that wasn't that favourable," Cook added. "But, he's going to be out for four weeks plus, which is a huge disappointment. "Matt Tubbs had similar bad news with his foot and he'll be out for at least a month. But it gives others an opportunity and we'll concentrate on the lads available. "We're really pleased with the players who've come into the squad latterly. Caolan Lavery and Marc McNulty give us a really good edge at the top end of the pitch."